The destruction of large cities and the Hoover Dam are not easy to accomplish but the crew does it well enough, and the 1080p video and 5.1 high definition audio help to enhance those scenes beautifully. It's a well-circulated idea that at some point California is going to break off and fall into the ocean. It sits on top of a highly unstable fault line that could shift at any moment and create a catastrophic earthquake, leveling whole cities. Warner Bros. explores this exact possibility in the Movie San Andreas. Coming out on Blu-ray and DVD this week, the doomsday film takes a look at what would happen if the fault actually moved. Ray (Dwayne Johnson; Furious Seven) is a search and rescue pilot who is excellent at his job. His ex-wife, Emma (Carla Gugino; Night At The Museum) and daughter, Blake (Alexandra Daddario; Percy Jackson:Sea of Monsters), need rescuing when the earthquake hits, so Ray does whatever is necessary to try and keep them all alive as the state is literally crumbling around them. While the concept of the movie is interesting, and, at least, a little bit original, it doesn't make up for the long, drawn out plot. There isn't much to the story other than action and, for me, it was simply boring and groan-worthy at times. When Ray has to save Blake from drowning, I found it unrealistic, not to mention annoying, since the reason Emma and Ray got divorced in the first place was because their other daughter died by drowning a few years before. To have Ray blame himself for not being able to save his other daughter only to then "find redemption" by (spoiler alert) saving Blake from drowning was just stupid. I sat there thinking, "Give me a break!" Add to the equation that the acting isn't very good, and it's just one more factor that makes the movie all the more unlikeable. While Dwayne Johnson won't ever win an Oscar, I'm usually ok with his acting. However, this time, he really isn't good, plain and simple and sadly, his performance adds to the subpar quality of San Andreas. The only part of the film that is decent is the special effects. The destruction of large cities and the Hoover Dam are not easy to accomplish but the crew does it well enough, and the 1080p video and 5.1 high definition audio help to enhance those scenes beautifully. The quality is sharp and clear, which helps to bring the grand scope of destruction to life. The extras aren't all that much better with an unfunny gag reel, a feature on Dwayne Johnson and deleted scenes that were deleted for a reason. The most interesting extra was "Scoring the Quake", discussing how the music affected the film and showing how the composer used unique sounds to make the music layered and richer. 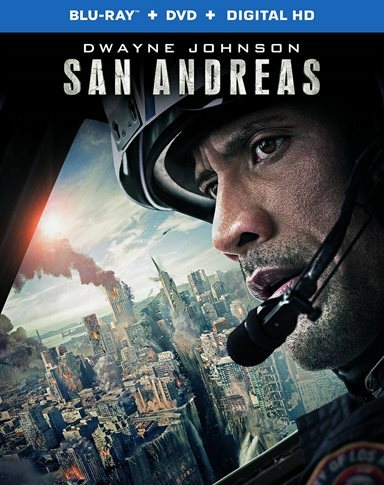 Download San Andreas from the iTunes Store in Digial HD. For more information about San Andreas visit the FlickDirect Movie Database.